Linear actuators from Schaeffler are playing a vital role in helping a manufacturer of roof panels to eliminate virtually all sources of defects in its machining processes, which in turn has enabled the plant to double its annual production output of ready-to-fit roof components. Kluth, a private, family-owned company based in Barsinghausen in Germany, is a specialist in producing sloping roofs made from lightweight materials. Planning, production and customisation to specific sizes are provided from a single source - a unique selling point in this sector. The production process for converting large format expanded polystyrene (EPS) blocks into custom-specific high precision Styrofoam parts, places very demanding requirements on machine builders. The roof and its related components such as insulating panels (strips), solid and acoustic fillers, counter slope strips, roof edge strips, vessel segments, joint profile fillers, expansion joint strips and other similar accessories, are manufactured from high quality, DIN-compliant materials such as polystyrene, polyurethane and mineral wool in compliance with the relevant standards. In order to ensure the quality of the different construction materials used, Kluth produces the polystyrene, for example in block form, using its own large foam moulding machines. 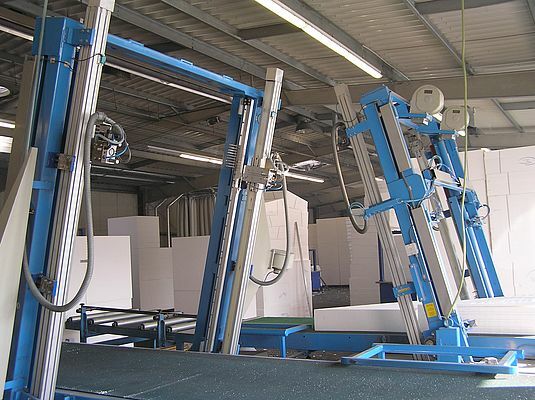 Using these machines, roof panels can be machined to specific customer requirements. At Kluth, the production and cutting machines run at least 12 hours a day, 7 days a week. In order to produce approximately 830,000 individual roof elements each year, hundreds of thousands of cutting operations are required to achieve this. These include not only basic parts but also ready-to-fit components. This requires high performance machines with a high level of automation. 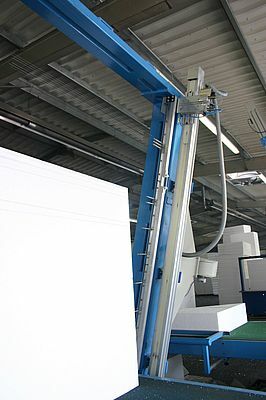 According to Managing Director at Kluth Marcus Kluth, with his practical experience and technology focus, the new EPS cutting machines, which automatically adjust the cutting wires using computer software control, enable rapid, defect-free production. "We are under enormous time and cost pressures and are not really in a position to produce any goods to stock. This means that our machines must be highly flexible and provide absolute reliability," says Kluth. Manually adjusting the cutting wires cannot fulfil the high requirements for dimensional accuracy and quality. Automated adjustment of the wires using linear actuators from Schaeffler has eliminated virtually all sources of defects and has also enabled Kluth to double its production output of ready-to-fit roof elements. At Kluth, the 3,000 x 1,200 x 1,000mm (3.6m³) blocks must be trimmed and then divided up according to customer orders. To do this quickly and economically with minimum waste, Marcus Kluth and his workforce of more than 30 employees rely on special machinery and equipment supplied by Dingeldein & Herbert Maschinen- und Apparatebau. This company, founded in 1936, is a specialist machine builder for the EPS industry and is currently headed up by brothers Markus and Christoph Dingeldein. The range encompasses not only EPS foam moulding machines but also EPS hot wire cutting machines of the conventional type or with oscillating wires, block tilting devices and block conveying equipment, compact hot wire cutting devices, profile cutting machines and pre-crushers, as well as fine grinding mills for processing of cutting waste. The machines are normally customer-specific solutions that are provided for standardised processes and by using a certain proportion of standard components and sub-assemblies. As Christoph Dingeldein states: "The machines operate continuously across multiple shifts and so must provide maximum availability. The machines must also provide high performance and quality, which is why we only fit high quality machine elements and work in close partnership with our customers and suppliers." The EPS blocks are separated systematically into specific customer orders into ready-to-fit roof elements and the cutting operation is mostly automated. In order to adjust the cutting wires automatically at high speed and with repeatable accuracy, as well as with minimal set-up time, two MKUVE20-B-ZR linear actuators from Schaeffler are used. These actuators adjust the individual cutting wire under computer or software control either in parallel or, where necessary, obliquely (for specially formed panels/strips). The MKUVE20-B-ZR linear actuator comprises an inherently rigid aluminium support rail with high load carrying capacity with a fully integrated linear guidance system. The extremely compact linear actuator is fitted with linear recirculating ball bearing and guideway assemblies and two carriages. This enables moderate loads, combined with high static loads about all three axes, to be moved with high positional accuracy at speeds of up to 5m/s. The drive system comprises a toothed belt and brushless servomotor. The linear actuators have a total length of 2,616mm with an effective stroke of 2,150mm. The actuators comprise profiled sections and guidance shafts cut-to-length from standard components and sub-assemblies and are supplied as ready-to-mount, factory fitted units with couplings, gearboxes, motors, sensor, cables and controllers. Christoph Dingeldein is enthusiastic about the technical advantages of the compact linear actuators and his company's partnership with Schaeffler: "We have quickly found a very good technical solution suitable for the practical application. We mount grippers on the carriage that allow the individual wires to be adjusted and set up quickly and with repeatable accuracy. The result is that the cutting machines can separate the EPS blocks into customer-specific roof elements without any interruptions. By using standard linear actuators, we were able to simplify the design of the adjacent machine, which means we need to produce fewer mechanical components which also reduces assembly work." At Kluth, the cutting and customising machines have helped to increase the production capacity for sloping roof panels from 300m³ to approximately 600m³ per day. 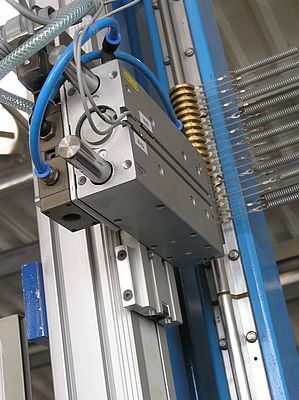 The wire adjustment system has now been adopted as a standard configuration in machines from Dingeldein & Herbert. As a result, several further EPS cutting machines have been fitted with linear actuators from Schaeffler. In addition, similar linear actuators are now also used in other roof material cutting machines, as well as for the stacking and unloading of machined roof elements.